As a Jon Brionphile, it’s easy to over-credit the Los Angeles mainstay: his Beatles-meets-Bacharach songwriting and Enoian sense of mid-fi production ambition make for a complex but unmistakable sound evident in the work of artists from Fiona Apple to The Bird and the Bee. Brion, of course, has friends, from Apple to Aimee Mann — all frequent visitors to his homebase, West Hollywood club Largo. While the Largo brand of unpopular pop had its heyday a decade ago with the release of albums by Brion, Apple, Aimee Mann, Elliott Smith, Badly Drawn Boy, Rufus Wainwright and others, the sound has spawned a few new practitioners over the years, perhaps through incestuous links in the comedy scene: Brion has been musically involved with Judd Apatow’s Funny People and the Adam McKay/Will Ferrell camp on Step Brothers and The Other Guys; Step Brothers star John C. Reilly is a Largo regular and appeared, too, in the Mann-soundtracked Magnolia. Which brings us, in this surreal Six Degrees of Charlie Wadhams, to Reilly’s Walk Hard: The Dewey Cox Story, a supremely funny movie satirizing Johnny Cash biopic Walk the Line. 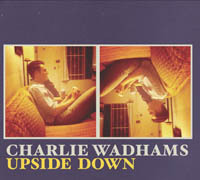 Wadhams co-wrote “Let’s Duet” and “Guilty as Charged” for the film and had another of his songs in Reilly’s Cyrus, showcasing a style both clever and heartfelt. We all know what happens to life’s best-laid plans. “You can do anything that you want,” he notes hopefully in the song’s chorus, yet Jim’s — or Charlie’s — travels have apparently landed him in Sacramento: not some sweet southern clime. Soundtracking this introspection is sweet, crisp autumnal music, all softly strummed guitars chords and nimble percussion. It’s the kind of deft, thoughtful release that ought to win Wadhams a regular invite to Largo — he’d be right at home, don’t you think?